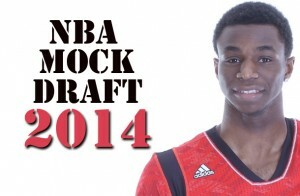 We have all been told that the 2014 NBA Draft is so packed with talent that there will potentially be upwards of 8-10 franchise players available, including the unanimous top pick Andrew Wiggins. The 2014 version will see numerous NBA teams in “Tank Mode” for the services of not only Wiggins, but players like Julius Randle, Jabari Parker, and Marcus Smart. Although we are still roughly 300 days until the actual 2014 NBA Draft, it’s never too early to predict the prospects. As such, these Mock Draft rankings are based on potential with this year’s Draft order based on last season’s team records from the NBA regular season, without taking into consideration for team needs as of yet. These are only my choices and not the consensus picks of all of The Hoop Doctors writers, with that said here is my 2013 Mock Draft:Version 1.0. Touted as the best pro prospect since Kevin Durant, Wiggins is blessed with through the roof athleticism and an elite level ability to score the basketball. He is still rather thin but could be the best player in college basketball as a freshman next season. The gem of Kentucky’s recruiting class is a bruising PF that can score from anywhere, rebound, and play above the rim. He’s an instant NCAA POY candidate and potential superstar at the next level because of his elite skill set. Coach K struck recruiting gold landing Parker, another surefire one-and-done type player that reminds many of Carmelo Anthony. He’s only above average athletically but may have the best offensive arsenal matched with NBA size of any prospect this season. If he would have come out last season, he probably would have been the top PG taken because of his NBA ready size and play-making abilities. His leadership qualities, deadly pull-up jumper, and lock down defense make him a bonafide Lottery pick. Because he is already 18 years old and not a US citizen, Exum has the choice to either go to college or turn pro next season. He excelled on the worldwide stage at the Nike Hoop Summit and the FIBA U-19 Championships, making him one of the hottest prospects next season. What makes Exum so special, he has the skills to play either PG or SG at an elite level. With a year of college ball under his belt, Cauley-Stein now must capitalize on being on everyone’s radar as a premier 7 footer. He’s still a work in progress but he’s an athletic big, with rim protecting ability, and a developing offensive game. Known as the best dunker in this year’s class, Gordon reminds many of Blake Griffin and will be an instant impact player for the Wildcats. He’s better all around than Griffin as a freshman in that he already has above average handles and a mid-range jumper to go along with finishing with authority at the rim. The nation’s top HS point guard will be running the show for Coach Cal from day one. He has above average size and scoring ability, matched with a knack for making the correct pass at the proper time. Many compare him to Jrue Holiday. Kansas’ other top freshman prospect besides Wiggins, also has elite potential to be a great pro player one day. He’s the definition of raw but by season’s end should be one of college basketball’s best big men and shot-blockers. The son of former Purdue and NBA standout Glenn “Big Dog” Robinson has made a name for himself at Michigan as an athletically gifted forward that plays above the rim and excels at slashing to the basket. He’s made strides in improving his jumper, making him a potential Lottery pick. Already blessed with an incredible 7’5 wingspan, height and length are his obvious attributes. But he also has offensive range to beyond the 3 point line, rebounds well, and has elite shot-blocking ability. Still only 19 years of age, no one is sure just how tall Austin will grow but he must add weight and develop a more potent offensive game to excel at the next level. The reigning Big 10 Freshman of the Year decided to return for his sophomore season, and scaring opposing teams in the process. When healthy, Harris causes havoc on the defensive end, as well as score from anywhere on the court. he has the potential to be one of the premier guards in all of college basketball. After withdrawing late from the 2013 Draft, the sharpshooting native of Croatia has decided to return to Europe for another season in hopes of becoming an NBA Lottery pick. If Exum goes the NCAA route, Saric may be the first International player selected. After beginning his freshman season in Ann Arbor a bit slow as he adjusted to the college game, McGary was a beast during the postseason as he became the physical double-double machine that once shattered a backboard in the Elite 24 HS Game. He has legitimate NBA size but with only average athleticism and reminds some of Kevin Love as a best case scenario. I don’t think anyone would deny that McDermott has been the college ranks’ most prolific offensive player the past 3 seasons and it was a bit surprising to see him return after 2 consecutive 1st Team All American nods. Even with another stellar season, he probably won’t become a Lottery pick because of a lack of athleticism but he reminds many of a poor man’s Larry Bird, that has legit NBA size and scoring prowess. Touted as a surefire lottery pick after his freshman season, McAdoo returned to Chapel Hill and got a bit exposed despite having the tools and physique for the next level. He’s expected to play a leadership role as a Junior and must expand his offensive game to be considered a Lottery selection. Payne made the right decision to return for his senior campaign, as the Spartans are loaded and should be a Top 5 team all season. He has NBA size, athleticism, and the skill set to be a star at the next level but must be more consistent and prove he has the motor and drive to match his abilities. After earning Atlantic 10 Freshman of the Year honors, Christon is a big, long, explosive PG with great speed and passing ability. Outstanding ball-handler who collects a ton of steals but must cut down on turnovers and improve his jump shot to be an elite player. Considered a potential John Wall 2.0. Likely to be paired alongside Andrew Wiggins in the Kansas backcourt, this fabulous freshman also has one-and-done potential as an elite scorer with size that was a volume scorer in HS. He has a powerful physique and is used to overpowering opposing players but needs to prove he can be dominant at the collegiate level. Potential Top 10 pick in 2015. Syracuse lost a lot from last season but return both CJ Fair and sophomore big man Jerami Grant, who should be prominent players this season. While Fair my score a bit more, Grant has more potential as a pro because of an impressive 7’2 wingspan, making him a match-up nightmare defensively. Great all around athlete that has a raw, physical skill set, still only 19 years sold. Not many players had a better Summer than Harrell, who will try to take the place of Gorgui Dieng in the Cardinals frontcourt. He played alongside Marcus Smart on the Team USA U-19 squad and dominated the competition on the International stage. Although a bit undersized, he makes up for it with a 7’4 wingspan and an incredible leaping ability. Should be fun to watch on the offensive glass this season. With DeShaun Thomas off to the NBA and Aaron Craft not really a big offensive weapon, odds are sophomore forward LaQuinton Ross will be the one that steps up and become OSU’s primary offensive option. He’s a bit slender and needs to improve his consistency, but some view him as a Scottie Pippen type player when fully developed. While his twin brother Andrew will get more of the attention as the maestro of the Kentucky offense next season, don’t sleep on Aaron, who was the top rated SG in HS. He has both outstanding size and unlimited range from well behind the arc, that should keep defenses honest for potential top pick Julius Randle to star on the inside. With another season under his belt, Ellis looks much more comfortable, as the potential starting PF for Bill Self this season. He’s still not a finished project but came on strong late last year as a double-double type forward that could put up monster rebounding numbers with all of the talent in the Jayhawks backcourt. Stokes has been on the NBA’s radar since his freshman season but has been bothered by injuries and inconsistency over his first two seasons. He’s got a massive frame and 7’1 wingspan, perfectly built for the next level. Has the ability to be an elite rebounder as one of the hands down strongest players on the college level. Young hasn’t quite lived up to the hype of being a McDonald’s All American coming out of HS, but with the Florida backcourt now full of inexperienced faces, the ball will definitely go through the chiseled big man that looks more like a Gators lineman than hoops star. One of the nation’s potential impact freshmen, Vonleh has the potential to be Indiana’s premier player immediately this season. He has in insane 7’4 wingspan, making him an outstanding shot-blocker for his position. Vonleh is a do-it-all type player that will crash the boards and dive on the hardwood for every loose ball, making him an instant fan favorite in Bloomington. A potential NCAA POY candidate, Russ may be the hardest to guard player in college basketball. By returning for his senior season, he will be forced to take over some PG duties with Peyton Siva graduated, which is a good thing, considering that would have to be his position at the next level. With that being said, some have compared his offensive game to a young Allen Iverson. Not many across the country know much about Early, but he may be the best mid-major player in the nation with legitimate NBA potential. He’s a bit undersized for PF in the NBA but is a versatile offensive player, capable of scoring both inside and out. Streaky but elite level 3 point ability. Although his nickname, “Slo-Mo” doesn’t parlay well at the next level, Anderson may have one of the most complete skill sets of any player on the collegiate player. He struggled a bit to fit in alongside Shabazz Muhammed but he can play any position from 1-4 on the floor, even point guard at 6’9.